Costus, Spiral Ginger or Costus barbatus is a perennial with very attractive dark green leaves that are fuzzy underneath and are attached to the spiraling stem. The long red inflorescences (are arranged in a terminal head or spike) are complimented with bright yellow tubular flowers. Because of this head or spike it is also called, Red Tower Ginger. Clumps of these plants spread easily and produce plants that normally get to six feet tall. Spiral Gingers take their names from the spiral-arranged leaves. 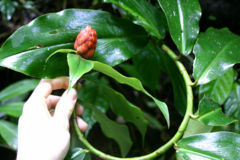 The Spiral Ginger is the most commonly used of the Costus family. Costaceae or the Costus family is a family of flowering plants. There are about 200 species that are perennial herbs. There are a number of species native from tropical America, Africa and Australia. They are fairly different from other gingers and many botanists give them their own family name: Costaceae. Suriname’s traditional medicine is a great user of the Spiral Ginger. Suriname's traditional medicine is many centuries old and based on the knowledge of the indigenous people of the Amazon rainforest, the Amerindians and Maroons and on that of the Asian immigrants. In Suriname's traditional medicine there are about a thousand (1,000) plants and herbs used to cure everything, from hepatitis to rash. Traditional Suriname herbalists recommend using an extract of the stem for treating gonorrhea, but they also prescribe it for the common cold, eye problems, and for use as a laxative. In Ayurvedic medicine, Costus is valued for its tonic, stimulant, and antiseptic properties. This plant also has anodyne, antibacterial, antispasmodic, aphrodisiac, carminative, emmenagogue, and vermifuge properties. There are claims that it is an aphrodisiac, but there is no evidence to support its effectiveness. Costus is used in the treatment of abdominal distension and pain, chest pains due to liver problems and jaundice, gall bladder pain, constipation, and asthma. It also stimulates the appetite. The oil of Costus is used in treating rheumatism; and as a hair rinse, the essential oil is said to retard the onset of gray hair. In Tibetan medicine the root is used to treat bloating, irregular menstruation, pulmonary disorders, and wasting of muscle tissues. It is considered to have an acrid, sweet bitter taste with a neutral potency. I is also used for difficulty in swallowing. The Costus root acts on the spleen and large intestine. It helps ease abdominal pain and is good for dysentery. It can heighten body awareness and sensitivity and can enhance libido. Costus comes in various forms and is an ingredient in many products. For best results, read and follow product label directions. There are no known safety issues or interactions associated with Costus when taken in the recommended doses. If you have jaundice, and/or liver or gallbladder problems, it is best to consult with your physician before using Costus for the treatment of your condition. Safety in young children and pregnant or nursing women is not known. Costus / Costaceae / Costus barbatus / Costus Root / Spiral Ginger / Red tower ginger / Cana de jabali / Apagafuego / Sangrafu / Muxiang Supplements & Products Buy Costus supplements and products that contain costus.